Excessive deforestation, increased pollution leading to the end of lives of plants and trees have resulted in scanty rainfall during monsoon in most parts of India. Regions that receive ample rainfall otherwise, recorded the least last year. Even before the summer season kicked in, the blazing heat has created a distress amongst millions of lives. This brings about to show how the selfish motives of human beings have led to dig our own graves and suffer enough. Lack of concern towards natural resources is an old habit that refuses to die. We have not only made things worse for ourselves but also for the coming generations. However, its better late than never. When there’s always scope for improvement, it’s best to get on with it with no further delay. As we list down some of the ways to avoid wastage and conserve water, it’s important to make a mental note about the things that we can do ourselves amongst the list and those that need support from another individual or the system in general. For landlords, it becomes important to lay certain ground rules for the tenants to stick to while letting their properties on lease or rent. Following these will not only save you from making a dent in your wallet but also gives a chance to be a better human being. Be it in the kitchen or bathroom or garden, always check for leaks that might result in wastage of water. If you find any, fix them at the earliest. There are plenty of low budget waterproofing/water sealing products available in the market. Until you get a plumber to fix the leaks, these products can be handy and help with immediate temporary solutions. While doing the dishes, avoid keeping the water running all the time especially when you brush to remove greases from the dishes. Make it a habit to keep the taps closed when you don’t really need water for certain tasks. Also, practice soaking thickly greased utensils in water instead of scraping off with the water running from the faucet. New water faucets and faucet accessories are high-performing, water-efficient fixtures that will help you save water, energy, and money. By installing these faucets in bathrooms and kitchens an average household can save up to 700 gallons each year per faucet. While India is still inclined to relying on housemaids to clean the pile of dirty dishes, as we progress and when both adult members of the family are working outside, high travel time, and accommodating the maid’s time becomes a challenge. To beat this, a dishwasher can become a contemporary necessity, at least for the modern urban India. Research indicates that hand washing uses around six times as much water as a typical modern dishwasher to wash up a typical pile of dirty dishes. Also, these days, dishwashers are labelled with the water and energy ratings. Investing in a laundry basket is a good idea and make sure to wait till it fills completely to run the washing machine or even hand wash clothes. Washing every day can double the usage of water. It is not required to wash your vehicle every day. When you do, it would be best to choose a commercial car wash that recycles water or wash your car on the lawn so that the grass receives water as you wash your vehicle. Another option to wash your car is to use a bucket and cloth rather than using a hose. It makes ecological and financial sense not to waste a pure natural resource available in large quantity on one’s roof. In the case of a home-builder, at an initial stage of construction, investments in time, design, and money are minimal for adopting roof rainwater harvesting that can result in tackling water shortage issues in the summer. Ground water sources are increasingly getting depleted or are getting polluted. Bore wells are either silting up, getting short of water or are drawing polluted water. Therefore, rainwater harvesting makes a lot of sense for a homeowner. 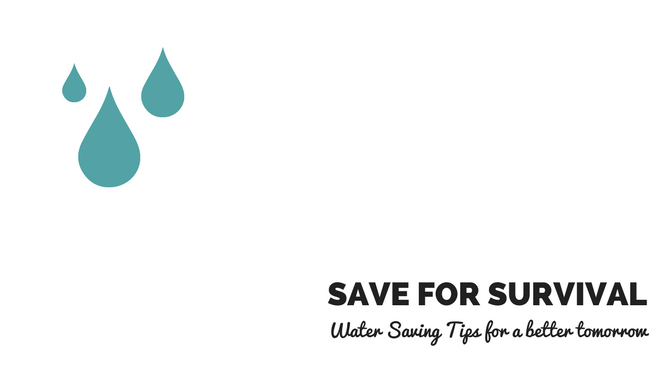 Doing this can save up to 5 gallons of water each time. It’s important to teach the kids and rest of the family members to follow this, that can help a better tomorrow. Also, educate them to turn off the faucets tightly after each use. If you happen to hear of any leaks in the house or elsewhere, take the ownership to check and tighten the faucet to stop the leakage. Do not procrastinate. Especially, when you are off to bed in the night and you hear droplets falling off the faucet from the bathroom, be sure to move out of the bed and run a quick check. Some of the apartment associations have already taken steps to install individual water meters in their apartment buildings that help monitor the water usage by each apartment. Billing is also based on actual consumption of water vs the overall consumption by everyone in the building. In malls, office buildings and environment concerned groups, you will find that water is recycled for usage in restrooms and other areas. Every day, so much of water is wasted while bathing and other activities. If we want to make best of such water, it is good if all new buildings implement the systems to collect and recycle used water. If you have ice cubes that you want to throw away, do not throw them into the kitchen sink. Instead, throw them in a house plant. Avoid 30 minutes’ bath and take a 5-minute shower. This, can not only save gallons of water but also time. Use drip irrigation for shrubs and trees to apply water directly to the roots where it’s needed rather than pouring buckets of water each time. Also, water only when necessary. More plants die from over-watering than from under-watering. Wash fruits and vegetables in a pan of water instead of running water from the tap. Monitor your water bills for unusually high use. Your bill and water meter are tools that can help you ascertain the levels of consumption and if there are any leaks. Toilet leaks are usually silent and such leaks can be identified through monthly bills. It is in the best interest of everyone to use a broom instead of water to clean patios, sidewalks and driveways. This can save plenty water that will otherwise be used in cleaning large spaces. There are several ways to save water and it all starts with you and your attitude towards conserving energy. Before it’ s too late, be a leak detective, prioritize water conservation, be an educator and most of all, be a doer while you create awareness.